Product information "HI83306-02 Multiparamenter Photometer & pH Meter for Environmental Analysis"
HI83306 is a compact, multiparameter photometer for use in the environmental lab or in the field. The meter is one of the most advanced photometers available with a innovative optical design that utilizes a reference detector and focusing lens to eliminate errors from changes in the light source and from imperfections in the glass cuvette. 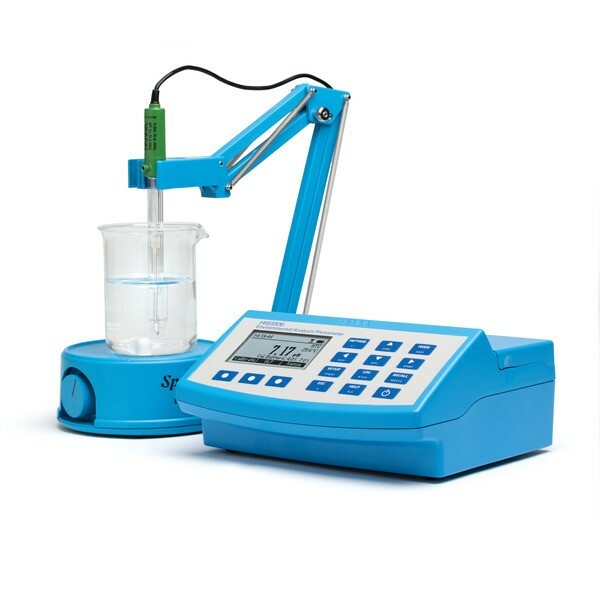 This meter has 23 different programmed methods measuring 16 key water quality parameters and also offers an absorbance measurement mode for performance verification and for users that would like to develop their own concentration versus absorbance curves. Environmental-specific parameters include nitrate, phosphorous and dissolved oxygen. To save valuable laboratory benchtop space, the HI83306 doubles as a professional pH meter with its digital pH/temperature electrode input. Now one meter can be used for both photometric and pH measurements. The HI83306 benchtop photometer measures 16 different key water quality parameters using 23 different methods. This photometer features an innovative optical system that uses LEDs, narrow band interference filters, focusing lens and both a silicon photodetector for absorbance measurement and a reference detector to maintain a consistent light source ensures accurate and repeatable photometric readings every time. The HI83306 was developed to measure the most common parameters in environmental water quality monitoring. Nutrients such as nitrates and phosphates are key indicators of nutrient pollution from agricultural sources and are considered dangerous to environmental waters.Too few nutrients and waters will be unable to sustain healthy ecosystems; too many nutrients and algal blooms can form, which can be detrimental to water quality and aquatic health. Dissolved oxygen is an essential to performing biological processes for many forms of aquatic life, such as fish, plants and microorganisms. The HI83306 offers an absorbance measuring mode that allows for CAL Check standards to be used to validate the performance of the system. The absorbance mode allows the user to select one of the four wavelengths of light (420 nm, 525 nm, 575 nm, and 610 nm) to measure and plot their own concentration versus absorbance mode. This is useful for users with their own chemical method and for educators to teach the concept of absorbance by using the Beer-Lambert Law. Users can easily select any one of the 23 measurement methods via the dedicated METHOD button. HI83306 is designed with an innovative optical system that incorporates a beam splitter so that light can be used for absorbance readings and for a reference detector. The reference detector monitors the intensity of light and modulates when there is drift due to power fluctuation or the heating of the optical components. Each part has an important role in providing unparalleled performance from a photometer. A beam splitter is used as part of the internal reference system of the HI83306 photometer. The reference detector compensates for any drift due to power fluctuations or ambient temperature changes. Now you can rely on a stable source of light between your blank (zero) measurement and sample measurement. The sample cell of the HI83306 fits a round, glass cuvette with a 25 mm path length. Along with the advanced optical components, the larger size of the cuvette greatly reduces errors in rotation from the indexing mark of the cuvettes. The relatively long path length of the sample cuvette allows the light to pass through more of the sample solution, ensuring accurate measurements even in low absorbance samples. HI83306 is supplied with sample cuvettes and caps (4 ea. ), cloth for wiping cuvettes, USB to micro USB cable connector, power adapter and instruction manual. Related links to "HI83306-02 Multiparamenter Photometer & pH Meter for Environmental Analysis"
Customer evaluation for "HI83306-02 Multiparamenter Photometer & pH Meter for Environmental Analysis"